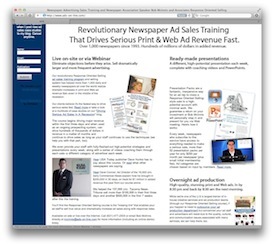 If you read our free e-book "The 7 Essential Elements Of Successful Ad Sales Training Initiatives", we've become convinced that working the system and the ad rep's accountability make the difference between a newspaper that generates $100,000 in the short term and finishing the year at over $1 million in added revenue. In fact, these two final steps (see steps 6 and 7 in the infographic at right), as explained in detail in the last couple of chapters of the e-book, make such a huge difference that we've decided to help out busy ad directors with the day-to-day implementation of these steps throughout the year, too. Now, when we work with a newspaper, we first pick a number of target accounts from the start, usually totaling anywhere from $500,000 to $3 million. We call them the "Dream 50" or "Dream 100". Then, once the initial training is completed (through step 4 in the infographic at right), we provide complete presentations for a large number of them immediately along with specific coaching videos on how to sell that particular ad. Most importantly, as most of our very successful clients have been doing, I meet with the ad reps often throughout the year, ensuring they're presenting properly and troubleshooting with them if they aren't selling. We're completely honest with the ad reps if they don't yet have the presentation down or aren't following the steps correctly and we hold them accountable. It's where many newspapers drop the ball, and it's tough to blame them. On the whole, I find in this new world of newspapers, most publishers and ad directors just have too much to do and too little time. This process, which can be applied to any training program, is all explained in my e-book without any big sales pitch for us. If you want a closer look at the infographic in this post, here's the full-size version. You'll also see a place where you can download the free document.